is this any good tech against Pirate Warrior (as Miracle)? Sabotage is a situational card, which with the right circumstances can turn the tide of the battle. It is a good idea to keep this card until your opponent has only valuable minions on board, or use its combo effect to destroy the opponent's weapon. 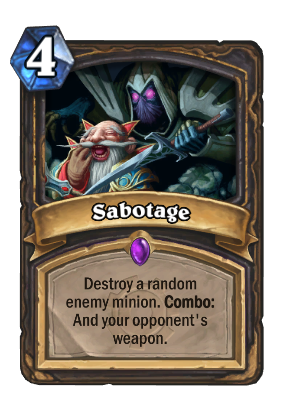 Sabotage can be used with no enemy minions on the board, for destroying the enemy weapon, provided its Combo is activated. Still have some potential , i will keep it for future meta . If you use this and kill Acolyte of Pain and Death's Bite, the deathrattle goes off and damages acolyte granting your opponent a card before it dies. I can also guarantee you most warriors have bigger minions than acolyte of pain lol..
an interesting comment at the end... thnx for noticing senpai I guess? "Best flavor text ever" - The beastie boys. Good card for miracle rogue. Will help a lot against warrior and mirror match-up. I really don't see this card being run in any kind of rogue deck. Maybe a tempo rogue running prep :( But this card without prep is way too slow. And the "flexibility" it seems to offer isn't a real one imo. Because if you want to destroy the opponent's weapon you have to combo it, and it may waste the 1st effect. On the other hand the situation where the card is used at it's full potential is so ridiculously rare that running it hopping to see the situation happen may be a waste. If the first effect was strong enough (keep in mind that deadly shot isn't run anywhere), it may be worth it to have it around, but sap/ooze/harrisson Jones already do the job. This card adds nothing. Next too expensive removal for rogues... it's 4 mana for a random effect. No point using it over assassinate. Thats a decent start from a control rogue deck. Not sure if it would work on a Tempo or Miracle deck, due to it's cost. Pack two copies of this one with other two Assassinate and the deck gets plenty of removals (not to mention direct damage). Add that with the neutral card to deal with secrets. Not a broken card, but another nice tool in the box. Well, as people may have pointed out, it is a more expensive deadly shot. Counting mana: 3 for Deadly Shot, 0.5 for Ooze's effect, bundled into a 4 mana spell. So, you lose a bit of mana. The biggest catch here is the combo. Unless you use something like Bakestaybe or Prep, you'll need to expend a bit more than the 4 mana. I think it's a pretty situational card, as it'll be useless against Priests and Zoolock. Rogues have enough removal, even if most of it isn't "hard removal". And I've been using Deadly Shot to some success lately, so the random bit isn't a concern for me. So, this card is ok-mediocre. Maybe people might see it fit to run one, depending on the meta. Ok, let's really take a bit of a look. This costs 1 less than Assassinate, but 1 more than Deadly Shot. Now, one point of contention is how cards interact based on class. Deadly Shot in Hunter fills a niche roll, and the hunter damage spells don't generally compare as favorably to the Rogue ones mana wise, especially if you consider Sap as a way to remove on of the creatures so you can kill the one you want. The secondary effect is indeed also niche. As people have brought up only 5 classes have weapons, but those are also some of the more popular classes ATM, and Jarraxas is indeed on the rise in Handlock and having a way to kill that weapon is a huge deal. Harrison Jones body is often mediocre for its cost and often much more situationally bad, where even if the secondary effect isn't good the primary effect isn't extremely overcost and easy to manipulate. I think this has alot more potential to see play than Assassinate, but neither is extremely strong if the meta shapes up to be extremely aggressive. Another point is, they can't make spell that are just direct upgrades to other spells, classes are already fairly balanced around their spells so making new ones that don't instantly warp the meta is pretty important. Is it me, or is this artwork totally unrelated to act of Sabotage? Sabotage: deliberately destroy, damage, or obstruct (something), especially for political or military advantage. 1 mana for a combo destroy the opentents weapon? 2. combos are most of the time very huge (si 7 agent deal two damage for just one attack) but destroying just a weapon is for free, even as a battlecry(swamp oze) the combo realy needs to be more for 1 mana or the mana cost needs to be reduced!